I’ve seen this mural – and others like it. 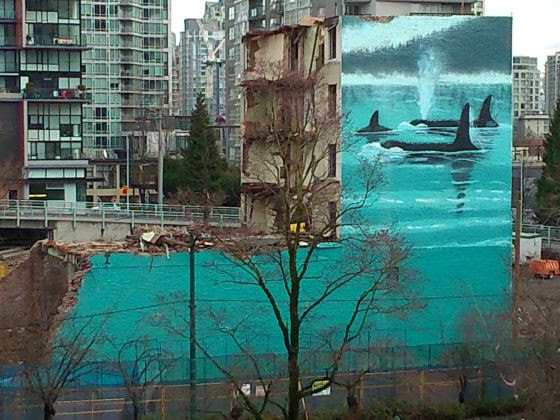 From the talented artist, Wyland, this building was an icon in Vancouver, BC, our neighbor to the north. An article on the demolition is here. “It’s progress, Hank! Progress is good.” Peter wiped his hands on his Carharts as he readied the controls. Peter swung the wrecking ball again, the resounding strike tumbling aqua-colored bricks like teardrops on the ground. The full quote of Dostoyevsky’s is: “Man, do not pride yourself on your superiority to the animals, for they are without sin, while you, with all your greatness, you defile the earth wherever you appear and leave an ignoble trail behind you — and that is true, alas, for almost every one of us!” from the Brothers Karamazov. Nicely crafted piece with a strong moral. And well spotted on the pic, taken from Granville Street Bridge. I love how you start with the quote and then work yourself in this dialogue.. A great quote to start from… one to remember and use. Great story, and so true. It’s even more touching letting the demolition workers philosophize about it while they do their work. A sad thing to destroy such a picture. Erin, funny, but we seem to be following each other in the comments! Or, I am following you… each time I open a story, there you are, right before me! This is one of my favorites this week. The Dostoyevsky is potent enough, but the truth in the storytelling is haunting and so beautifully done! Thanks for including the link. I was stunned to see the photo, unaware that the Whaling Wall had been torn down. 😦 Ahh… sad. PS) hoping you got my late reply email?? Will be home Aug. 25th, but available after Sept. 8th. Good work, Erin. I’m impressed that so many FF writers knew the location of this mural. So sad that it had to be demolished. Teardrops tumbling down… nice… says a lot, Erin. Thanks for the link… I knew I had seen it somewhere… Vancouver, of course. Wonderful story. Love the dialogue of he men – they seem powerless. Do we all use that as an excuse I wonder? Also love how you’ve used the quote. I meant ‘the men’, not ‘he men’. Sorry. That last line is heart-breaking. Well written.